By Raymond Britt -- The 2010 Chicago Marathon was a hot one, temperatures soaring into the 80s. A total 36,159 runners made it through high temperatures to cross the finish line. 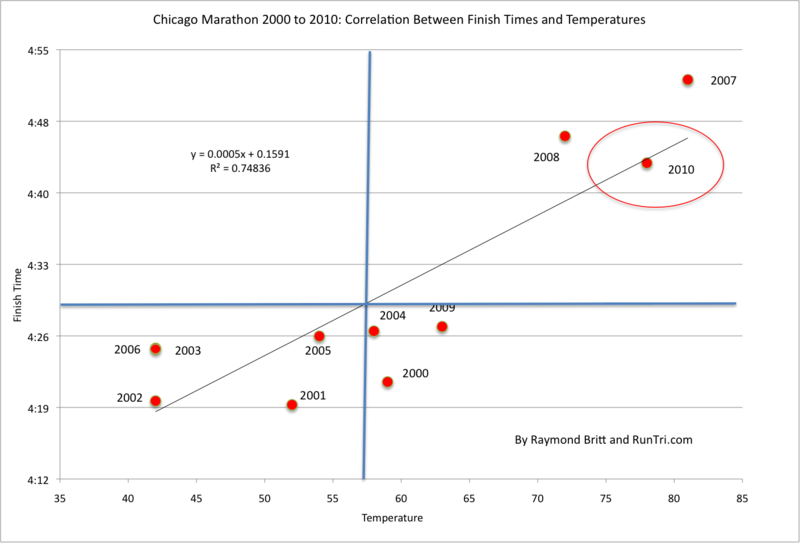 While the heat did not rival 2007, and the cancellation of that race, the 2010 race was marked by a much higher than average finish time -- 4:43:38 -- and roughly 2000 runners dropping out. And this result was consistent with an analysis we had conducted before the event. Before the race, we wondered: how do differing temperatures impact average finish times? We plotted the average finish times and average race-day temperatures for the last 11 years to find the answer. And it seemed to be generally good news for runners as long as temperatures stay below 65 degrees. However, when the average temperature soared over 65, average times would drop, we noted. 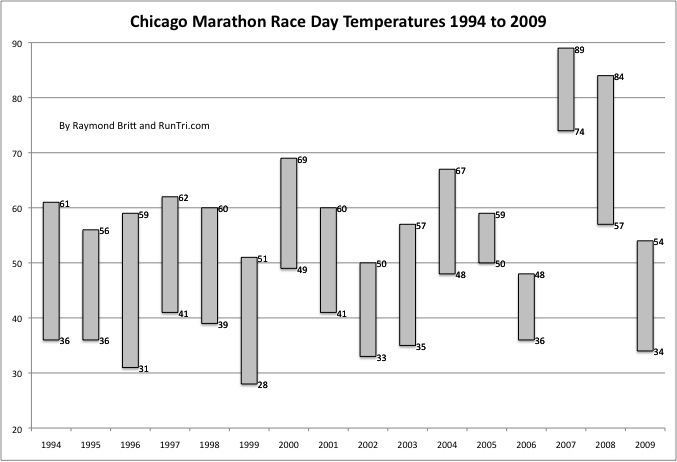 And that's just what happened in 2010: high 70s average temperature, and a 4:43:38 average finish time. In earlier years, when the average temperatures are between 40 and 65 degrees, average finish times may vary within a range of between 4:19 to 4:27. Only an 8-minute difference. Not bad. Of course, everyone's race experience and acclimatization is different, so above all else, don't take chances with the weather; follow any and all race organization alerts, suggestions and warnings. 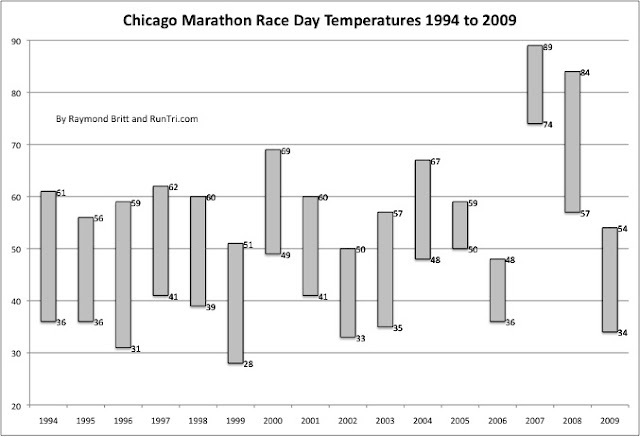 Temperatures for the Chicago Marathon since 1994 have ranged from a low of 28 degrees in 1999 to a high of 89 in 2007. The 2007 race was canceled after it started, due to extreme heat. Only one race was not run due to weather: Could be worse: the 1906 Chicago Marathon was postponed due to rain. For everything else you need to know, visit Chicago Marathon.